A engaged audience of UPNG students and staff ready for the debate. Emerging leaders at the University of Papua New Guinea (UPNG) exchanged perspectives on some of the key issues facing the nation at the 2017 School of Business and Public Policy Debate Competition. The competition was held form 21-22 September and included teams which represented the divisions of economics, public policy management, strategic management and business management. The Economics Students Society were crowned champions after they defeated the Public Policy Management Students Society in the closely contested final. 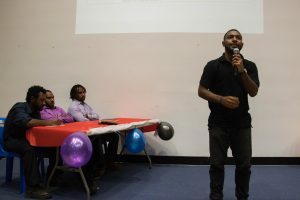 Bobby Kunda, President of the UPNG Economics Students Society, said the Debate Competition encouraged students to consider different perspectives on important topics for Papua New Guinea. “The competition is a forum for intellectual discussion about ongoing issues in the nation,” Mr Kunda said. Methuselah Eka Wabiria from the champion Economics team. Topics included the development of small-medium enterprises, the privatisation of state-owned enterprises, the attainability of Papua New Guinea’s Vision 2050 and reserved seats for women in parliament. 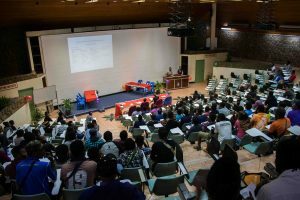 The 2017 School of Business and Public Policy Debate Competition was organised by the Economics Students Society and supported by the Pacific Leadership and Governance Precinct partnership between UPNG and the Australian National University. The Precinct supports dialogue and discussion on Papua New Guinea’s development challenges and how capable, ethical leaders can support positive change.